Boasting wide stretches of warm, yellow sand, bright blue seas, and lush green forests, the coastal state of Goa is one of India’s most popular tourist destinations. Not only is it a paradise for nature lovers, but its rich history and culture will engage the keenest historians. Go through this list and all the queries worrying you will vanish by the time you reach the end. The following list combines some popular tourist sites in and around Goa, with some of the state’s lesser known attractions, including a couple of food and wine tours and some excursions to the nearby spice plantations. Tall and intricately decorated, this 16th century edifice is the largest church in Asia! With ornate Iberian architecture and delicate mosaic work, this church is a must-see for any visitor to Goa. Flaunting beautiful, Baroque architecture, this 16th century three story basilica will leave visitors in awe. Infamous for its unique architecture style which combines elements from both Portuguese and Tuscan architecture forms, no Old Goa tour is complete without a visit to this site. Containing artefacts from the pre-historic, early historic, late medieval and Portuguese periods, this museumwill excite any budding historian. The only one of its kind in Asia, this museum displays some beautiful Indo-Portuguese Christian art works, representative of Goa’s rich religious and cultural identity. A 16th century archway, the Viceroy’s Arch was built as a memorial to Vasco De Gama by his great grandson and then governor of Goa, Francisco De Gama. Built in 1738, this temple is dedicated to Goddess Shantadurga. The temple has been renovated multiple times, but is still one of Goa’s most beautiful Hindu worshipping sites. One of the most majestic forts in Goa, the Reis Magos fort was built in 1707.The Reis Magos fort sets itself apart from other Goa forts with its reddish stone walls. Built by Italian friars in the 1600, the structure boasts tall Corinthiam pillars, and the inside of the church is shaped like the Christian Holy Cross. The impressive architecture will leave visitors in awe! This was the first Christian ecclesiastical structure in Goa, boasting traditional Portuguese architecture. 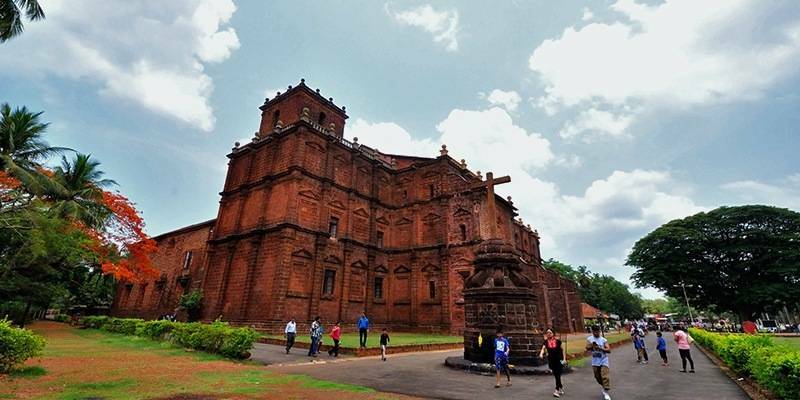 Built in 1510, this church is one of Goa’s oldest and most underappreciated wonders! One of the most luxurious overnight cruises in Goa, this houseboat trip is on the higher end, but provides unparalleled comfort and hospitality services to its guests. This glamorous houseboat offers its guests scenic views of Goa’s backwaters. Guests also get to enjoy some scrumptious home-cooked Goan delicacies on board. Located in the quaint little Siolim village, this luxury houseboat provides unrivalled comfort and is perfect for large groups and families. Equipped with large, comfortable beds, private rooms and other amenities, this gorgeous houseboat is perfect for couples or honeymooners looking for a romantic getaway on Goa’s backwaters. Casino Pride Cruise Ship: Duration of Cruise: 24/7; Visitors can check-in anytime, but have to check out on the same day. This is not your traditional houseboat, but is equally enthralling and is perfect for late night partiers and casino and gaming enthusiasts. Here, guests can enjoy a leisurely, scenic cruise across the Mandovi River, enjoying the beautiful on board performances, including the traditional dekhni and fugdi folk dances and mandos singing. 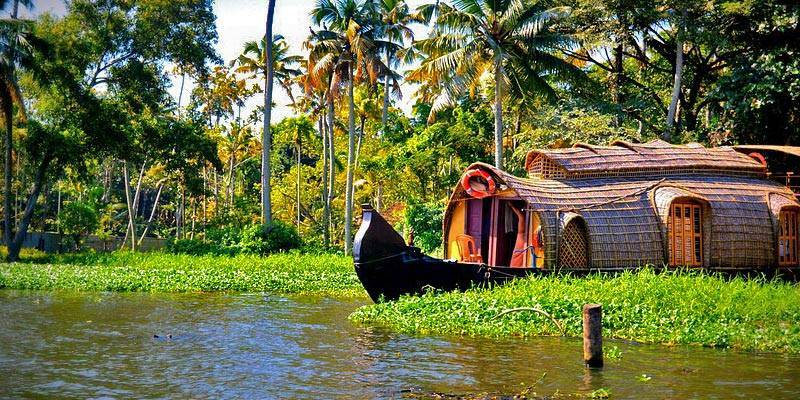 Here, guest can enjoy the beautiful sunset views sitting on a luxury boat on Goa’s marvellous backwaters. Guests can avail of their own private houseboat and cruise along the river, watching fishermen casting their nets, or the birds and bees dancing on the beautiful, pristine waters or catch a glimpse of some of the ancient temples that line the river banks. Note: Each cruise has its different check-in and check-out times. Please refer to these cruises’ official websites for more information on timings, duration, costs etc. Most of the tours in this list last for up to 2 to 3 hours, but it varies depending on the tour guide, weather conditions etc. Also, most of these plantations are only open to the public for a couple of hours a day, so make sure to visit the sites’ official websites to get more specific information about each of these tours. Situated in Keri, visitors here indulge in some of the area’s finest herbal tea before being taken on a tour of the rich, green plantations. To top it all off, guests are served a delicious Goan meal on banana leaves. This plantation is known for growing some of the region’s best spices, coconuts and betal nuts. A tour through the plantation, followed by a nice, hot lunch, is truly a delight! Located next to the Mandovi River, this plantation grows innumerable spices and other cash crops. Visitors can boat, eat or enjoy a gentle stroll in the Pascoal Spice Village Plantation. Nestled delicately in a lush, green valley near the Dongruli village, this sweet-smelling plantation is home to many spice plants, tall fruit trees and small, winding rivulets. This trip is complete with a guided tour of the spice plantation and its many facilities, followed by a nice, home-cooked lunch served on banana leaves. This plantation grows innumerable species of aromatic, herbal and medicinal plants, all using organic farming methods. Visitors also get lunch after their tour of this plantation. Filled with a wide range of medicinal plants, this swamp forest is said to be over 250 years old! One of India’s tallest waterfalls, the Dudhsagar Waterfall is nestled delicately near the Goa-Karnataka border. The pure, milk-white water here falls from a mind-boggling height of 310 metres and will truly leave all visitors in awe. 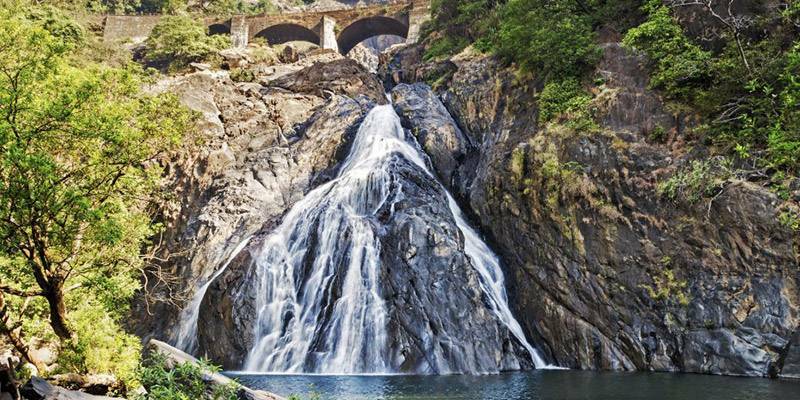 There are multiple trekking routes up to this waterfall which all provide magnificent scenic views of the hills, valleys and forests in the surrounding area. This site is best visited during the monsoon season, when the entire waterfall is filled with deep, gushing water. The water cascades down a steep mountain slope and falls down below into a beautiful, pristine lake. Trekkers can dip their feet into the lake’s cool, crisp waters after having completed the climb up the mountain to the waterfall. The trekking trail is relatively steep, so visitors must ensure they are physically fit to traverse the mountainous terrain. 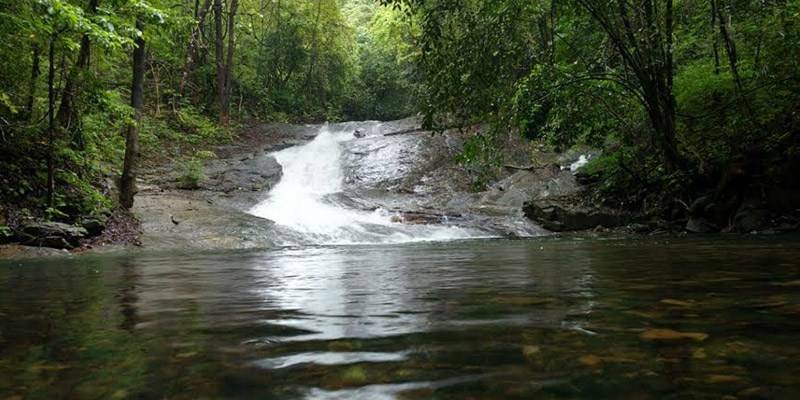 A nice 90 minute walk from the infamous Mahadev Temple, (also known as the Tambdi Surla Temple) dedicated to Lord Shiva, this waterfall is nestled delicately between thick green forests. Many tourists prefer to trek up to these magnificent waterfalls from the quaint little Tambdi Surla Village nearby. The gentle, cool spray of the waterfall will surely rejuvenate every trekker’s senses. The trekking trail is a bit challenging at times, but should not be too difficult to navigate. It is recommended that trekkers take a local guide with them, so as to minimize any difficulties en route. The route is lined with gentle streams and charming birds and butterflies. En route, trekkers can also visit the Bhagwan Mahavir Wildlife Sanctuary and see nature at its finest. If trekkers are lucky, they may even spot a wild animal or two prowling in the forests. Located in Ponda, the Butterfly Conservatory of Goa is an exciting destination for any budding botanist or nature lover. 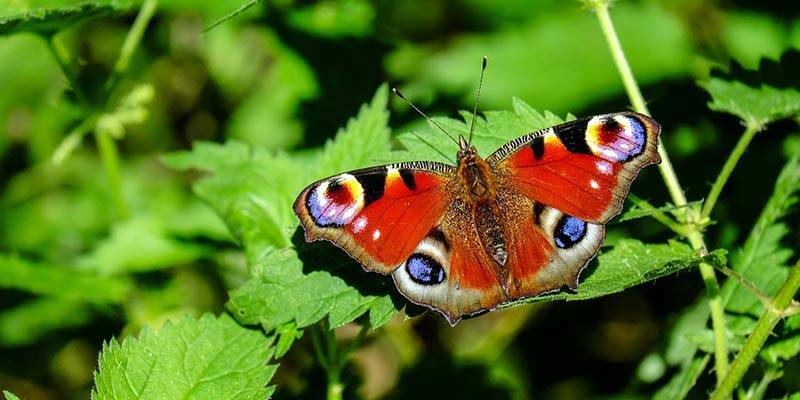 This conservatory houses more than a hundred species of free-flying butterflies, although it is very unlikely that tourists will be able to spot all these species in one visit. The conservatory is pretty small, and is located on the slopes of a lush, green hill. Visitors get to go on a nice, long guided tour of the conservatory to make the best out of their visit to this place. There are a couple of man-made ponds and gardens in the conservatory, too. The colourful flora and fauna provide a picturesque scene for any professional photographer, too. This conservatory is best visited in the morning, and visitors can spend up to an hour exploring the beautiful natural landscape. There are some spice plantations nearby, too, which are worth a visit. 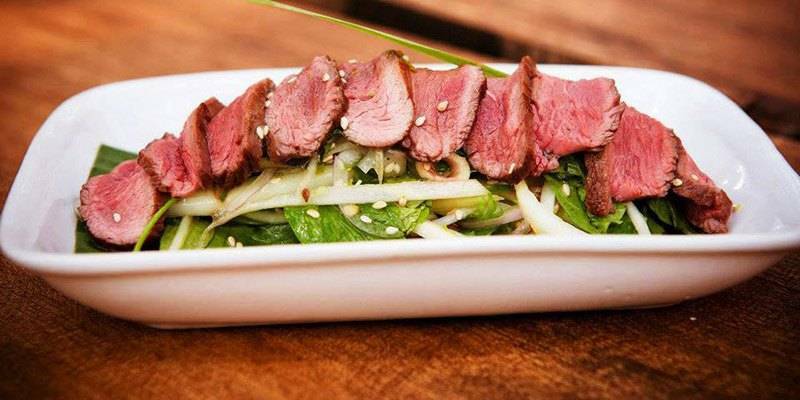 For all the foodies out there, this activity provides tourists with the best culinary experience in Goa. There are an array of culinary workshops and tours available here, including a guided tour to a farmer’s market and even participating in a cooking class and learning to whisk up a deliciously scrumptious local meal. For all the food loving travellers, Rahul’s Cooking Classes teach guests how to whisk up a delicious, nutritious Goan or North Indian style meal, including learning how to make nice, warm rotis, aloo parathas and malai koftas. Here, learn the intricacies and secrets of cooking a traditional Goanese lunch including the infamous Goan fish curry, and also visit the nearby markets to learn about and stock up on some fresh, local ingredients. With fun staff and a warm, friendly environment, this is a perfect activity for large groups or families passionate about Indian cuisine. Travellers can opt for a one day tour, or a seven day tour! Tourists get a chance to explore some of Goa’s finest ingredients and learn how to whisk up a nutritious, scrumptious meal here. Goa’s largest wildlife sanctuary, here, a nice long jungle safari awaits travellers, complete with scenic views of the surrounding mountains, cool, winding rivers, and dense green forests, all buzzing with wildlife. Tall waterfalls and small, quaint little villages are dotted throughout this sanctuary. Bhagwan Mahavir Wildlife Sanctuary and Mollem National Park: Distance from Panjim: 69kms; Location: Caranzol; Area: 107sq.km. One of the most popular wildlife sanctuaries in Goa, the Bhagwan Mahavir Wildlife Sanctuary contains the beautiful, green Mollem National Park, the ancient Tambdi Surla Temple, dedicated to Lord Shiva and the majestic Dudhsagar Waterfall. There are many overnight stay options inside the Park, too. 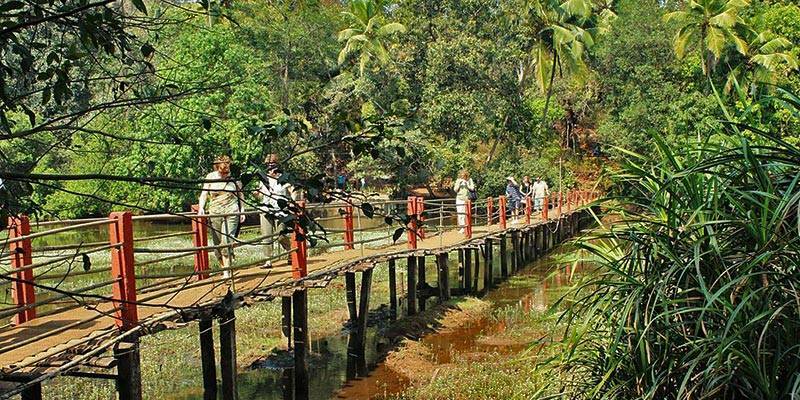 Cotigao Wildlife Sanctuary: Distance from Panjim: 70 km; Location: Canacona; Area: 86 sq.km. The beautiful Talpona River flows through this dense forest. Lucky visitors might even catch a glimpse of a bear or a wild boar or some eagles. There are some local tribal communities living inside these forests, too. Mhadei Wildlife Sanctuary: Distance from Panjim: 58 km; Location: Valpoi; Area: 208sq.km. This sanctuary houses some of the rarest bird and animal species unique to the Western Ghats, including the Royal Bengal Tiger. The more adventurous tourists can opt to white-water raft or hike in the forests, also. 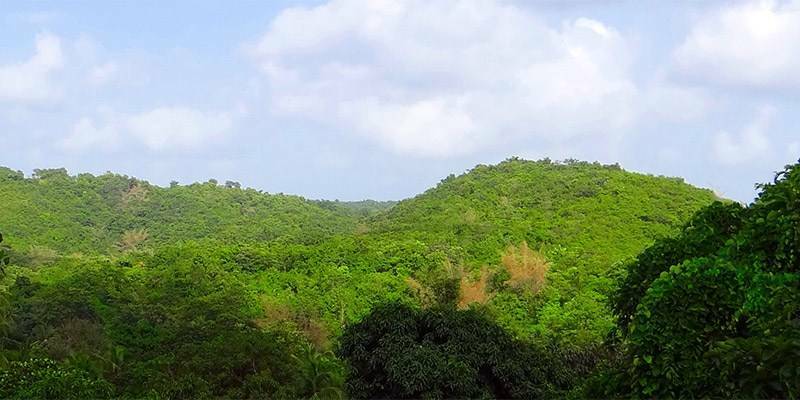 Bondla Wildlife Sanctuary: Distance from Panjim: 47 km; Location: Usgao-Ganjem; Area: 8 sq.km. A relatively small sanctuary, the Bondla Wildlife Reserve is home to the black-faced langur, wild boars, jackals and gaurs. The Sanctuary houses a small zoo, a deer park, a few lush green gardens and a couple of nice, homely cottages for visitors to rest in. Dr. Salim Ali Bird Sanctuary: Distance from Panjim: 6 km; Location: Chorao; Area: 1.8sq.km. This sanctuary boasts tall, dense mangrove trees and innumerable species of local, coastal and migratory birds. Jackals and crocodiles are also common in this sanctuary. The most famous beach in Goa, the Baga beach is popular for its nightlife and festive atmosphere. The waves are also quite high, making swimming in the sea here, a delight! Known for its serene, quiet atmosphere, this beach is known for its warm, yellow sand dunes. The shiny, silvery sand and the majestic blue waters on this beach are a true delight for any traveller. The beach is lined with shacks serving authentic, delicious Goan seafood, also.And some adventure activities to satisfy your adrenaline cravings. The Anjuna Beach is a true party hub and has a wide expanse of sandy beach dotted here and there with large, bewildering rock formations. Visitors here must jam to the Trans party music and indulge in the festive nightlife atmosphere on this beach. 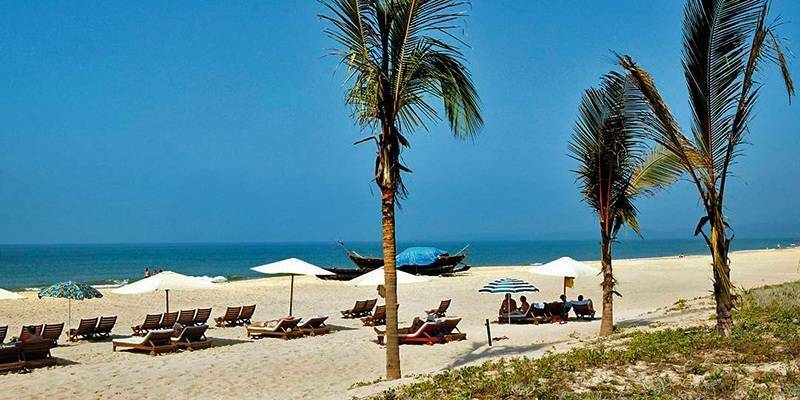 Dotted with nice, quaint little huts that give a breathtaking view of the surrounding sea, beach and cliffs, the Arambol Beach is perfect for families looking for a budget vacation in Goa. The Miramar Beach remains crowded throughout most of the day. It is filled with local souvenir and food shops, and is a perfect place to engage with Goa’s local people and culture. These are the places you can visit inside Goa but there are several other paces outside which can be visited if you have a day a couple of days to spare.Most people prefer to go to these places because from Goa they are near. 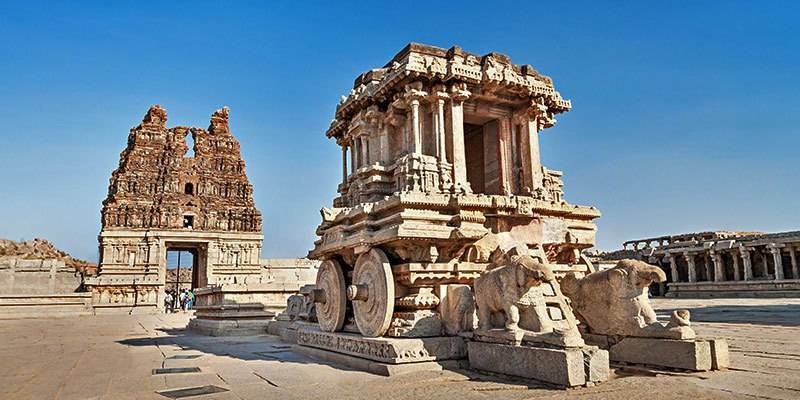 Its easy for you to visit Hampi from Goa than from any other cities like Bangalore or Mumbai. If you are in Goa then find some extra time so that you can get to know about History of Hampi or beach beauty of Malwa and Gokarna. Malwan is a 4 hour drive (143 km) from Goa. It’s a place where you can enjoy water sports and bite into some delicious Malvan sea food. The Most famous beach in Malwan. Filled with buzziling sea food market on one side and a serene peace full beach on the other side,Tarkali beach is the perfect place where you can take a stroll with nothing but breeze and waves to keep you company. Even though the name has nothing to do with the Island, at Tsunami Island you will find a plethora of water sports like jet skiing and scuba diving. Only way you could reach Tsunami Island is by boat. Remnant of the great Maratha Empire, Sindudurg fort is gold mine for people who have an eye for ancient architecture. Vengurla beach is situated at a distance of 40 km from Malava town. Just like Tarkali beach Vengurla is a calm and quiet beach where you can sit on the clean white sand to clear your head. Gokarna is most popularly known as a pilgrimage centre. But not just for the spiritually hungry Gokarna can satisfy the wanderlust of many who want to experience rich culture, pure nature and adventure. Pack for a trek if you want to visit this place. There might not be any water sports available but you can swim around in the calm pristine water. 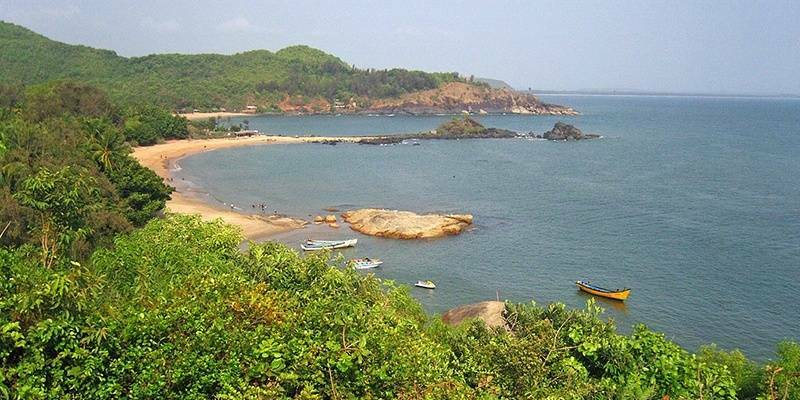 At around 7 km from the city of Gokarna Om beach is one of the most popular beaches in Gokarna. You can engage in several water sports and do some trekking around the beach. 10 minute walk away from Om beach, this crescent shaped beach is a peach. There are several shacks along the beach; you can enjoy the great sea food from those places. Since there are no life guards think twice if you are onto swim into the deep water. Trek around the virgin beaches of Gokarna. You will witness a spectacular sunset and a bonfire on the beach to top it off. Sign in for this activity if you could squeeze out couple of days out of your busy city life. 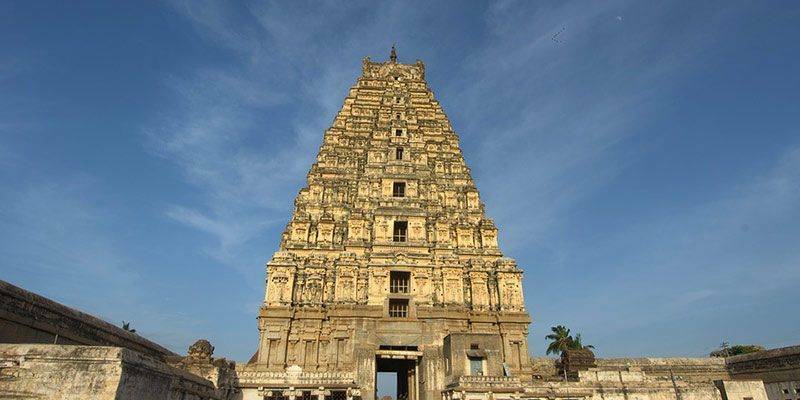 Located on the banks of the Tungabhadra River, Hampi is a small, ancient village in Karnataka. Much of Hampi today lies in ruins. It would take visitors approximately two to three hours to explore any one ruin/ temple/landmark in Hampi. Known for its intricate Dravidian architecture, this 15th century temple is one of the largest and most visited historical structures in Hampi. A series of steps leads visitors to the small temple atop the Anjenaya Hill, dedicated to Lord Rama and Hanuman. The view of Hampi from on top of this mountain is also spectacular. Built in the 7th century, this is one of India’s oldest temple structures and is dedicated to Lord Shiva. The outside of the temple is decorated with intricately carved symbols, animals and stucco figures. The Hemakutu Hill is dotted with ruins of Shiva temples, archways, pavilions and shrines. The sunrise and sunset from atop this hill is magical, too! Exemplifying some of the most intricate architecture of the Vijayanagara Kingdom, the Queen’s Bath is over 500 years old. The Lotus Mahal was a designated area only for women of the glorious Vijayanagara Dynasty. It is one of the only buildings in Hampi which still remains intact. Here, guests can witness the magical sun set behind the placid waters of the Sanapur Lake. It is not a very popular tourist destination, so visitors are ensured peace and quiet as they enjoy the scenery. Home to innumerable sloth bears, this sanctuary is a paradise for any nature or animal lover. There are watch towers, too, from where visitors can get a sweeping view of the forest below. Its not just Goa. All these places we showed you will give you an opportunity to experience this part of the world. The tropical climate with its vibrant nature is something worth taking a day or two off from the work which is eating you all this time. Visit all these places satisfy the curiosity and sooth the fatigued mind.